I told you I was on a bit of a pumpkin kick at the moment, didn’t I? This time I’ve added the big orange vegetable to my breakfast routine, pumpkin spice granola. 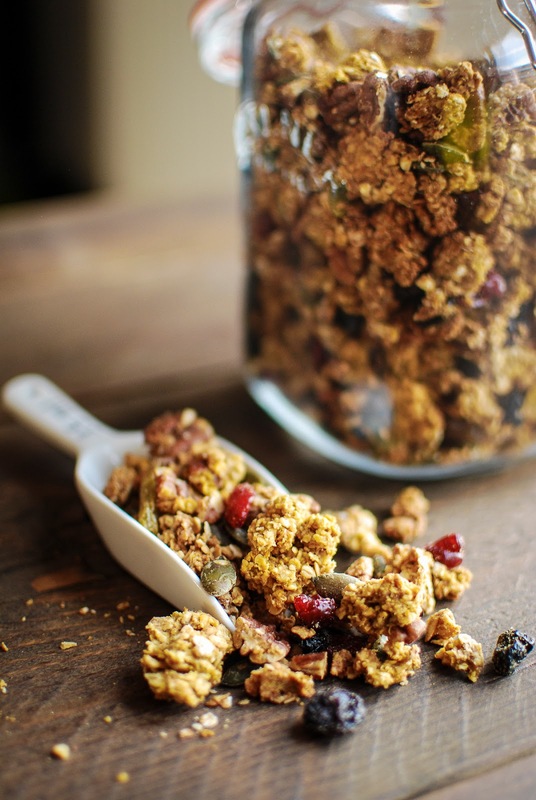 I make my own granola quite regularly, there’s something about the process I really enjoy. I have to admit, I think this one is my very favourite. When the lovely people at Vita Coco offered to send me out a few samples of coconut oil I thought I’d incorporate this good-for-you fat into my recipe instead of my usual rapeseed oil. It gives a wonderful nutty taste you just don’t get using oil, this is a swap for life. 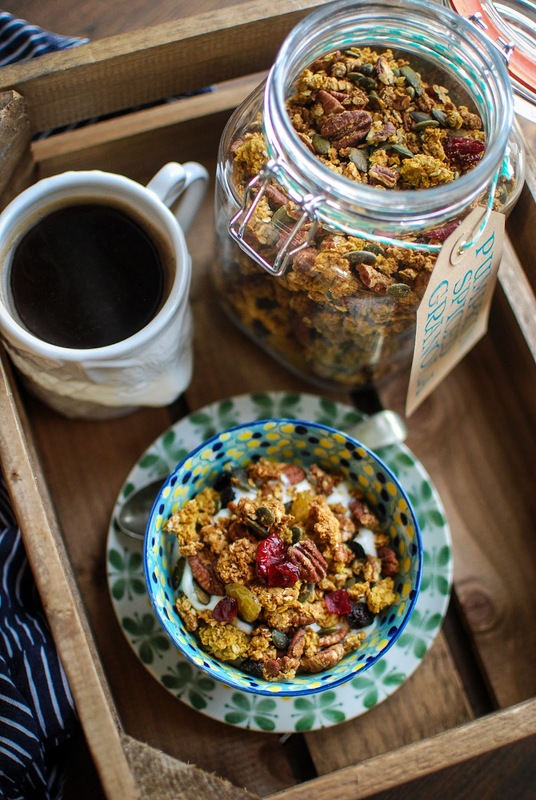 The best thing about making your own granola is how unbelievably easy it is, and it gives you a sense of smug satisfaction every morning knowing exactly what has gone into your breakfast. Extra kudos if you eat breakfast at work and can brag about your morning achievement. “Oh, I see you admiring my delicious granola. I made it myself!” Self high five! Keep your eyes peeled for more pumpkin themed treats over the next few weeks. 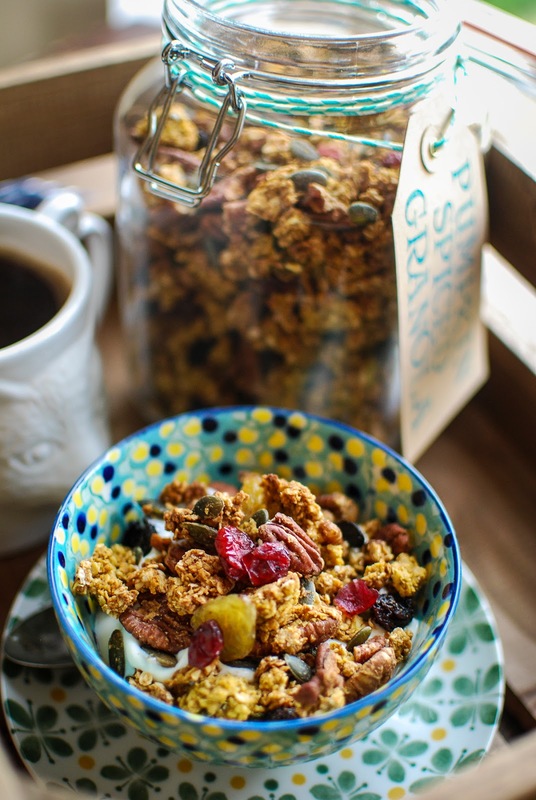 The best thing about making your own granola is how unbelievably easy it is, and it gives you a sense of smug satisfaction every morning knowing exactly what has gone into your breakfast. In a small saucepan set over a low heat melt the coconut oil, maple syrup and pumpkin puree together. Set aside. Mix the oats, pecans, seeds, sugar and spices together in a large mixing bowl and pour over the wet ingredients. Stir till everything is coated with the pumpkin syrup and spread mixture over two baking trays. Bake for 30-35 minutes until golden. Stir the granola around half way though the baking process, you can leave it quite chunky or break it up depending on how you like it. Allow to cool completely before transferring to a large jar. This looks amazing! Last night I made fish cakes with pumpkin seed in the breadcrumb – an inspired decision and one I congratulated myself on because they were delicious. 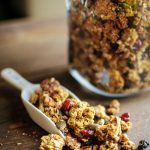 So, as I love granola and happen to have pumpkin seeds right here, I probably need to try this recipe! How much do you reckon it cost to make? I love this pumpkin spice granola. What a great idea!